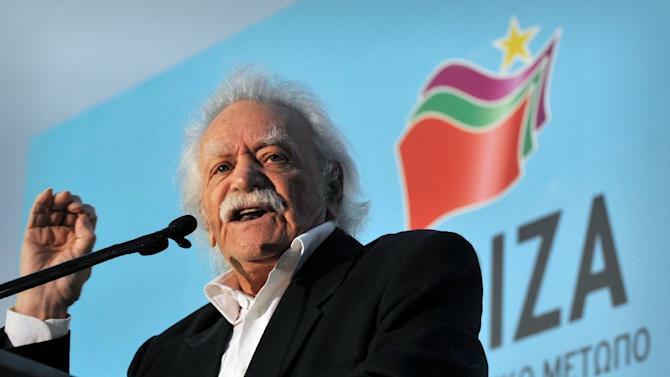 Manolis Glezos, Greek anti-fascist folk hero and MEP for Syriza, one of the most vocal critics of “austerity”. The imminent victory of Syriza over the concerted efforts of European politicians and Greek media moguls — the former cutting off the country’s financial sources as punishment for it voting incorrectly, in the language of Wolfgang Schäuble, the latter spreading fear and confusion throughout the land to perpetuate their own private interests — reveals that the idea of Europe is not dead, principally a Europe of the people, not of the wealthy and privileged. Moreover, it offers a glimmering of hope that the left does not die with those who heard Marcuse’s lectures live and in person! ‘Let’s think of it as a game… If ever one of us finds himself in danger of death, let him think of the other so intensely that he warns him wherever he may be … Right?’ says the narrator’s friend in Nicos Kazantzakis’s Zorba The Greek. And, indeed, perhaps Italy, Spain and Portugal will think of Greece, now that its population has revolted against the dictates of the bankers, the intelligentsia and the bureaucrats. Indeed, the next step lies with the European institutions. The IMF has already changed its tune accordingly, and Martin Schultz, president of the European Parliament, today also displayed an astounding about face. The above discussion is a basic introduction to the Greek debt crisis and the current referendum: what was being voted on? What is the context of the referendum in general? It’s at a very general level, so perfect for those with very little foreknowledge of the current impasse, or of European politics in general. It runs a bit shorter than an hour in length. I am a German-American who has ties to both countries. I speak fluent German and English, and passable Spanish and French. I can also mutter and curse in Turkish and Russian. I am at present a grad student of economics in Germany. In a prior life I studied dabbling, basically (religious studies, philosophy, political science) at the University of Alabama. My favorite piece of music is probably the Mass in B-minor by J.S. Bach, my favorite artwork is "The Blue Rider" by Kandinsky; my favorite building is New York's Pennsylvania Station, sadly demolished in 1963. I tweet (rarely) @dagmarholstadt, and also manage this site's Twitter account @OfContradiction. This entry was posted in Economics, Geopolitics, Politics and tagged democracy, Eurozone, Greek debt crisis. Bookmark the permalink.